The Federal Reserve just dropped the first of three potential interest-rate bombs on Wall Street – a quarter-rate hike that was supposed to send rate-sensitive assets scurrying. Instead, blue-chip dividend stocks, MLPs, REITs – almost everything headed higher, including the trio of heavy-yielding business development companies (BDCs) I want to show you today. Investors often look at interest rates and dividend-yielding stocks as a water-and-oil relationship. You know the drill. 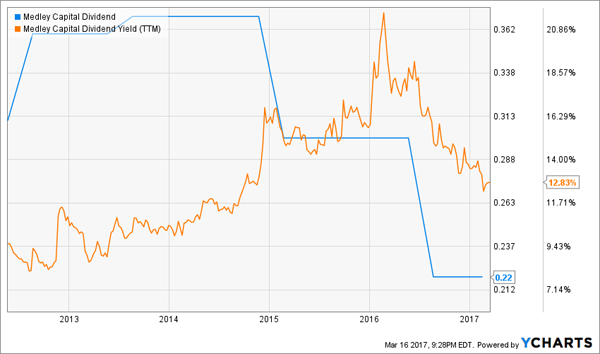 If interest rates go up, and Treasuries and other bonds begin to yield more in response, they’ll look more attractive versus similar (and even slightly higher-yielding) dividend stocks. After all, as secure as even the bluest, chippiest blue-chip stocks might seem, they pale in comparison to the full faith and credit of the United States government. And even when it comes to corporate bonds, you have a lot more security in knowing you’ll be repaid as a bondholder than as a stockholder. But BDCs? BDCs really don’t need to worry about that – for a few reasons. No comparison: This fluctuates with prices, but BDCs’ average yields can sit anywhere between 8% and 10%. Again, that’s an average. Meanwhile, the Fed funds rate after the hike sits in a range of 0.75% to 1%. The day the Federal Reserve announced the interest-rate increase, 30-year Treasuries – the longest commonly held Treasury bond – yielded just 3.1%. There’s simply no competition from a yield standpoint. Rising rates can actually HELP BDCs: While hikes in interest rates can pinch earnings in the short-term, a 2013 Fitch Ratings report asserted that “Increased exposure to floating-rate investments and generally heavy use of fixed rate funding has positioned U.S. business development companies (BDCs) well to adjust to the rising rate environment longer term.” Indeed, since the Fed first started bringing interest rates off the floor in mid-December 2015, the VanEck Vectors BDC Income ETF (BIZD) is up roughly 20% — and that’s including the big market dip in early 2016! The three high-yielding business development companies I want to share with you today follow the same rate gameplan. All of them – and most of the rest of the BDC space – actually gained after the latest round of Fed rate hikes, and all of them yield enough to ward away any bond threats. But a warning: While two of them look like excellent high-yield opportunities right now, one of them is a yield trap in disguise. Prospect Capital Corporation (PSEC) is one of the bigger BDCs out there, boasting more than $7 billion of available capital on a $3.3 billion market capitalization. It’s primarily invested in first- and second-lien secured loans, to the tune of more than 70% of the portfolio, and that’s across a broad array of investments that PSEC itself boasts is low in exposure to energy. And it’s hard not to like the headline stats for Prospect Capital Corporation (PSEC). After all, this BDC manages to yield a hefty 11%, and it does so at a slight discount to net asset value. But PSEC isn’t the healthiest dividend steward. Prospect Capital made headlines in late 2014 by announcing a deep cut into its monthly dividend, dropping the annual payout from $1.33 per share to $1.00 – 25% lower. The dividend has stayed at 8.33 cents each month ever since. Trouble might be brewing again – namely, PSEC is having dividend coverage issues. In its most recent quarter, Prospect Capital brought in just 24 cents per share in net interest income (NII), shy of the 25 cents it pays out per quarter. In the six months ended Dec. 31, 2016, NII declined 15% to 46 cents per share – short of the 50 cents per share it paid out in dividends over that time. That’s too close for comfort. PSEC looks less like a value, and more like a value trap. Stay away. 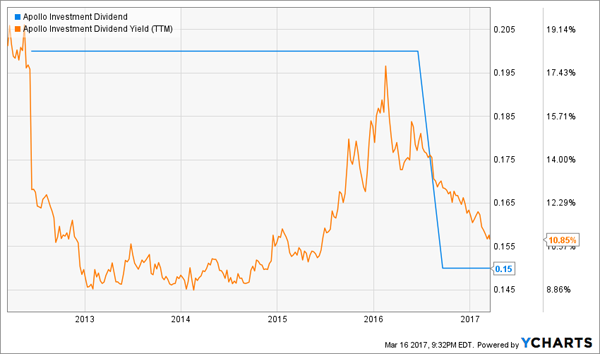 Prospect Capital (PSEC): Is Another Cut on the Way? Medley Capital Corp (MCC) is another BDC with a portfolio that primarily invests in first- and second-lien secured loans, and its portfolio is wide, ranging from healthcare to software to real estate to transportation. It too looks like a steal at a 20% discount to NAV right now – and that’s after a 16% crawl higher in the past year. But it too has dividend issues. Medley Capital first brought its dividend down from 37 cents to 30 cents in 2015, then reduced its dividend from 30 cents to 22 cents for its August 2016 distribution – and that’s where the payout has remained since. The problem? In the three quarters under the newly lowered dividend, MCC has brought in 62 cents per share in NII, but has distributed roughly 66 cents. Not helping things is the fact that one of its portfolio companies, United Road Towing, filed for chapter bankruptcy protection in February. Medley had $43 million invested in United Road. Kudos to Medley for recognizing its problem, but its first dividend drawback might not have been enough. 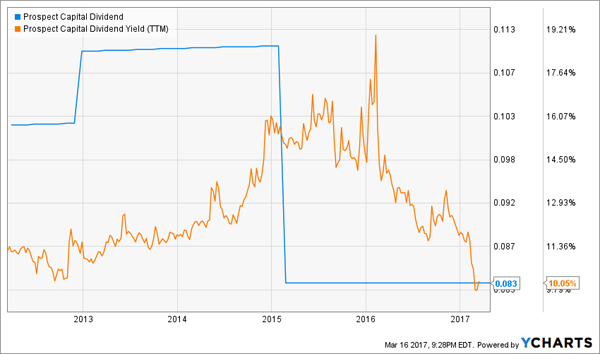 This nearly 12% in yield may be a wolf in sheep’s clothing. Did Medley Capital (MCC) Cut Deeply Enough? Apollo Investment Corp (AINV) is a private equity closed-end fund that’s affiliated with Apollo Global Management (APO) and makes its coin by lending out to middle-market companies. Nearly 70% of AINV’s portfolio is made up of secured debt, with another 12% in preferred equity, common equity and warrants, and 9% in “structured products and other.” In fact, only 10% of the $2.5 billion portfolio is invested in unsecured debt. The list of portfolio companies is long and diverse, ranging from a British residential solar company (AMP Solar Group) to an iron ore miner (Magnetation LLC) to SiTV, an English-language cable network that’s targeting the up-and-coming Latino audience. Keeping with the theme of dividend cuts, AINV is about half a year removed from its own reduction, from 20 cents quarterly to 15 cents. But here’s where I see an opportunity. Apollo Investment isn’t just hacking payouts – it’s reforming the business. Per the company: “We expect to focus even more on loans with lower loss given default characteristics primarily floating rate with a substantial portion in first lien loans. We are emphasizing portfolio diversification and avoiding outside single name or industry concentrations.” AINV is also reducing its energy exposure, which is now in single digits. Wall Street is buying into the “new” Apollo Investment, sending shares up roughly 15% since then – and still, AINV trades at a small discount to NAV. Meanwhile, it yields 9%-plus after the cut, and has the looks of a legitimate turnaround candidate. I love BDCs for their retirement-sustaining yields, but if you’re looking to keep yourself comfortable in retirement, you’re going to have to do a lot better than risky high-yield salvage stories. 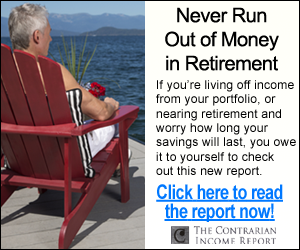 You’re going to need the 8%-plus winners I’ve featured in my “No Withdrawal” retirement portfolio. Dividend cuts to core portfolio holdings will turn your retirement into a nightmare. In fact, even stagnant dividends can be a sign of internal rot. That’s why the only way to be “safe” isn’t to hunker down into boring blue-chips with no upside potential. Believe it or not, to be safe, you have to focus on growth – that’s business growth, and dividend growth. Think about it this way: If you invest in blue chips that yield 2% or 3% a year, barely grow revenues and only pad their payouts by a token amount each year, what are you actually getting out of the deal? You’re probably getting 3% or 4% returns every year – which means if you have a million-dollar nest egg, you’re only earning $30,000 to $40,000 a year. Is that really enough to finance the retirement you’ve worked so hard to reach? 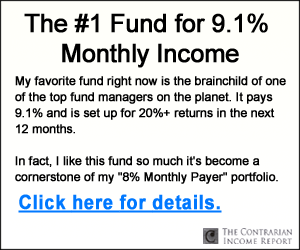 That’s why I’ve buried my heads in the books to compile a “No Withdrawal” retirement portfolio – a set of buy-and-hold picks that generate from 6% up into double-digit yields, and some of which even have 7% to 15% upside in annual capital gains. That means you can live off dividend income alone without ever touching your nest egg, but if disaster does strike, you’ve actually grown your retirement account enough that you can dip in without crippling your well-laid plans.